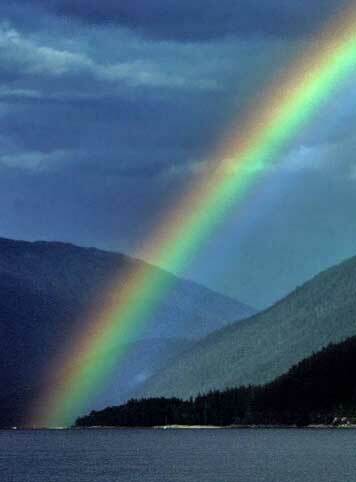 In a world of beauty, the rainbow stands alone—a grand and colourful coda to the tumult of a storm. Its stunning place in Nature’s pantheon has given it a somewhat unusual place in the human psyche: it has inspired myth makers, artists and scientists; it has been pressed into service in support of an amazingly wide range of human activities from rum to religion; it has been rendered graphically with capricious shapes and colour combinations. Indeed, so extensively have rainbows been used as metaphors for every conceivable human condition, that this plethora of symbolic, promotional, and graphical bows has taken on a life of its own. Certainly, these metaphorical bows bear scant resemblance to the natural bow from which they descended. While the story of the human interpretation of the rainbow is a fascinating one, it is not the theme offered here. Rather, the crayons are left behind and I look at the natural bow. I like rainbows—what can I say, I like them enough to have written a book about them. 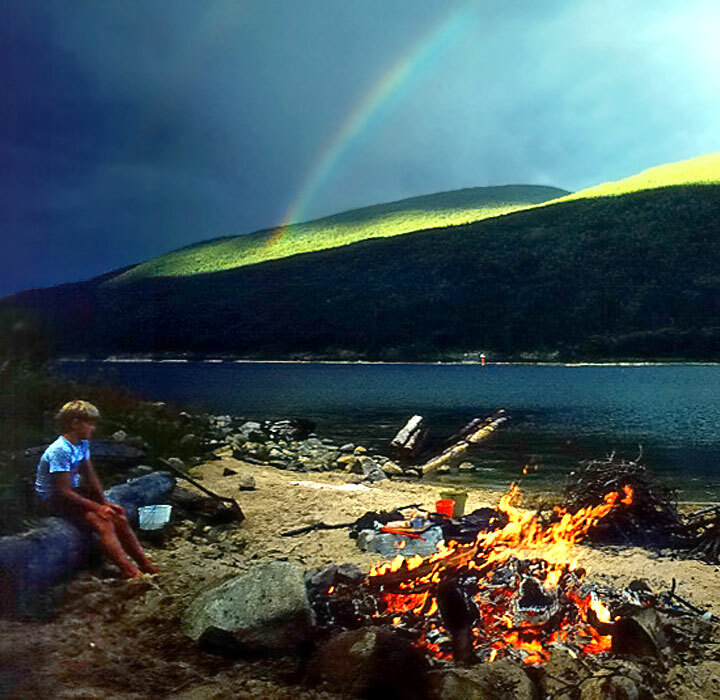 A bonfire on the beach; a rainbow in the sky. Fire produces its own light; rain does not. A rainbow is just sunlight, albeit sunlight which has been bent, separated into colours, and spread across the sky—nevertheless, it’s just sunlight. So, a rainbow takes many of its characteristics from the Sun: apparent colour, position in the sky, and even more subtly, apparent distance. 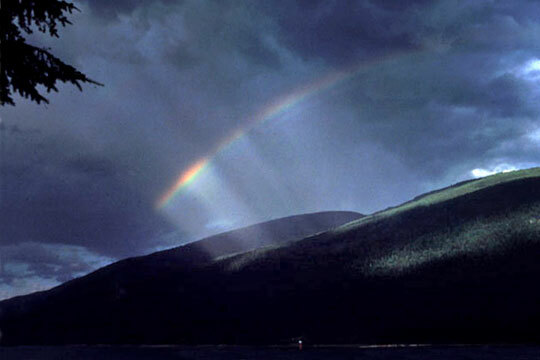 Rainbows are most commonly seen late in the day for two reasons: First, unless the Sun is lower than 42° a (primary) rainbow cannot form above the horizon. Second, although the Sun is low enough in the early morning, the requisite convective showers typically form late in the day. Rainbow colours Red is always on the outside of the (primary) bow. Graphic artists aside, nature is not capricious on this point. Rainbow location This rainbow seems to touch the Lake at Seven-Mile Point. 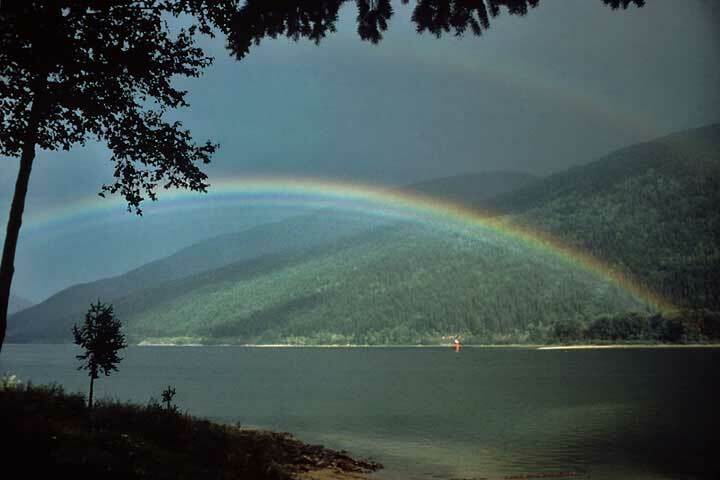 Appearances are deceiving: while the bow is clearly in the direction of the Point, and while the rain causing it is in front of the more distant mountains, optically the rainbow is at infinity (as is the Sun). Watch a rainbow while you travel in a car, the bow moves with you, just as does the Moon, Sun and other things infinitely distant. Personal bow The centre of a rainbow is the head of the observer’s shadow (here it is cast on the foreground rocks). 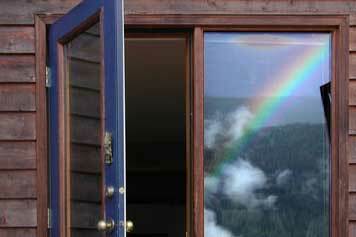 If an observer moves, his shadow moves and the rainbow moves. So, each rainbow is personal; a person beside you has his own bow. Wheel and spokes Other features follow from observer’s shadow being the centre of the bow. The Sun, the observer, and the observer’s shadow lie in a straight line. But, as all the sunbeams are parallel, they all converge on to the head of your shadow. So, sunbeams and shadows are all radials to the bow, streaming in toward the bow’s centre as if spokes on a wheel. In this scene above Troup, shadows are cast by cloud fragments. 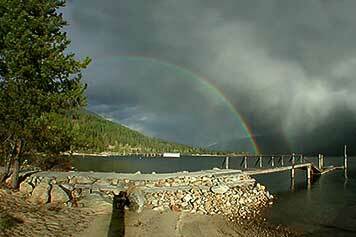 Simply awe inspiring Many of the features of rainbows can be seen in this one picture taken from Crescent Bay. The primary (inner) bow is a (portion of a) circle which has an angular radius of 42°. That means that if you were to point to the head of your shadow (the centre of the bow) with one arm and any point on the bow with the other, your two arms will make an angle of 42°. Red is on the outside of the primary bow. The fraction of the bow which is seen above the horizon depends upon the Sun’s elevation. As the rainbow’s centre is as far below the horizon as the Sun is above it (albeit on the other side of the sky), when the Sun is above 42° elevation, the (primary) rainbow will be below the horizon. When the Sun is on the horizon (not possible from the Lake owing to the mountains), a half circle is possible. The fainter secondary bow has an angular radius of 51°; red is on the inside. The sky is brightest inside the primary bow; the darkest part of the sky lies between the bow—an region known as Alexander’s Dark Band (after Alexander of Aphrodisias, who first described the effect about 1800 years ago). 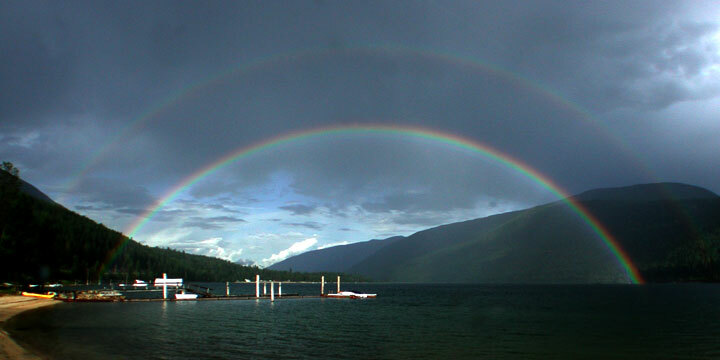 Other subtle, but characteristic features are seen: the primary bow is brightest and has its best colours near its base; just inside the primary bow there appear some other faint lines, known as the supernumerary bows. Supernumerary bows Some dictionaries will tell you that a rainbow is an arc of light formed by reflection and refraction of sunlight in raindrops. If this were true (as opposed to being a partial explanation of some features), one could never see the supernumerary bows. These delicate bands form on the inside of the primary bow and are explained by interference between adjacent portions of the wave front as it passes through the drop. Rainbow in sprinkler A garden hose was used to spray drops over the lake on a sunny day. Red is on the outside; it is darker beyond; supernumerary bows are on the inside. Streaks are from individual drops. 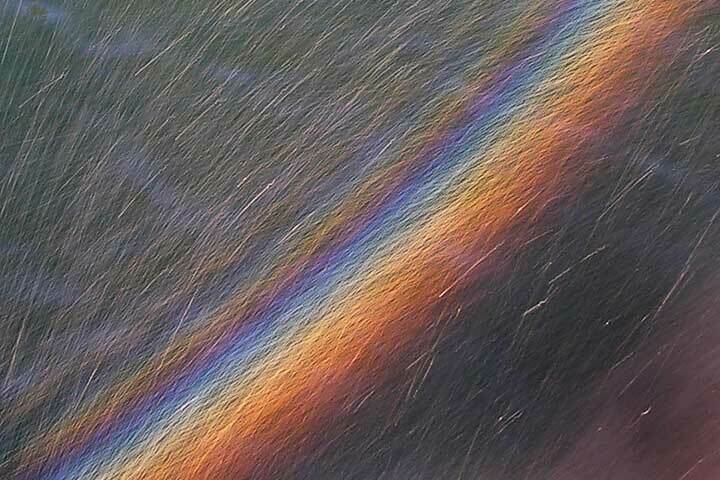 A rainbow is a mosaic of light from myriad drops, but usually raindrops are too distant to be seen individually. Rainbow reflection The rain from the shower has not stopped, but the Sun peaks out—clearly time to grab one’s camera and look for a rainbow. However, when rushing out the door, it is sometimes worth looking back to see if there is another interesting view behind. Guttation bows Any sunlit spherical drop of water can produce a rainbow. 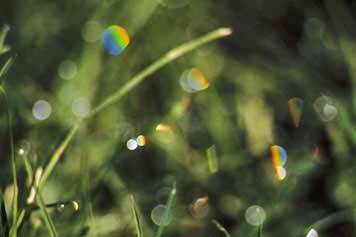 These are guttation drops which form at the tip of cold grass blades when the ground is moist. The warm roots continue to pump moisture, but the stomates on the blades have closed for the night. Moisture forced up the blade is extruded from and so hang from the blade tip. Guttation drops are not to be confused with dewdrops. Dew is distributed over the surface of the blade and form when the air is moist. The colours of the primary bow can be seen in the drop in the upper left and of the secondary bow can be seen in the drop in the lower right. A Double rainbow and supernumeraries over Troup.